11 August 2017. StreetSine Technology Group announces that X-Value™ crossed the mark of 150,000 computer-generated valuations per month in July 2017. In contrast, StreetSine generated 111,452 X-Values in July 2016. "In a market that transacts less than 10,000 properties per month, crossing the 150,000 mark is highly significant," said Jeremy Lee, Chief Technology Officer, StreetSine. "It supports two observations. "First, there is widespread adoption of computer-generated valuations by market participants. "Second, it suggests that interest is heating up in Singapore’s property market. Several property analysts, including a report from Morgan Stanley, suggest that 2018 will be a turnaround year for Singapore property prices. While we will have to wait and see if this turns out to be the case, X-Value indicates that interest in Singapore property is beginning to pick up." 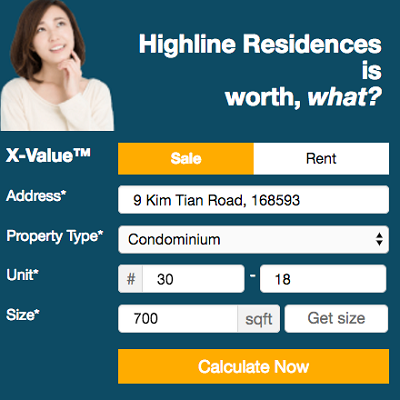 X-Value is a computer-generated appraisal of HDB, private condominiums, and landed properties in Singapore. This service is free to the public and brings greater transparency and efficiency to Singapore’s property markets by facilitating property pricing, valuation inspections and reports, and mark-to-market portfolio management. X-Value™ is computer- generated, real-time appraisal of a home's market value. Developed with government and private funding, it sources raw data from the nation's most comprehensive property database and instantaneously calculates a single value for any home using best practices methodologies, including comparable market analysis. Using web services, database management techniques, and algorithms, StreetSine computer systems collect published and proprietary pricing information from the property market. In calculating X-Value™, the computer uses Comparable Market Analysis (CMA) as the primary methodology for estimating the value of an apartment or a landed home. This approach is also known as the Sales Comparison Approach. It is the most common method for pricing a home for the purposes of buying, selling, renting or analyzing it. CMA evaluates Property Type, Location, Temporary Occupation Permit (TOP) Date, Last Contract Date, Tenure, Size, Floor Level, Relevant SRX Price Index, and External Area Value. All market participants such as Sellers, Buyers, Renters, and Real Estate Agents, benefit from the transparencies and efficiencies that X-Value™ brings to the market. Where can I calculate my home Value? Anyone can calculate X-Value™ on SRX.com.sg, including SRX.com.sg/xvalue-pricing and on its listing pages. How can I learn more about X-Value™? How can I track my home X-Value™? 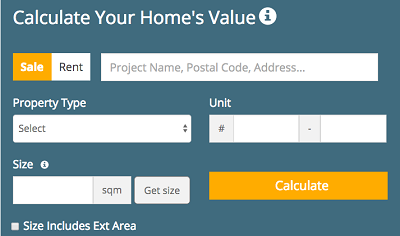 Everyone can calculate the X-Value™ of their homes on myProperty Tracker on srx.com.sg/tracker, absolutely free. What are the unique features of myProperty Tracker? Free market update. Every month, a subscriber will receive a notification with updated market value of their home. Key updates include Sale X-Value, Rent X-Value, rental yields and capital gains. This helps a user to gauge when is a good time to buy and/ or sell their homes for the best capital gains. Financial Planning. A subscriber can get great rates and fast loan approval without standing in a bank queue. Socially-friendly. A subscriber can invite friends to signup for the free web app via Facebook, Twitter, email, WhatsApp and SMS. User-friendly. Subscribe to the app for free through the SRX website (srx.com.sg) and access it through their mobiles phones, iPads and computers. StreetSine Technology Group, a subsidiary of Singapore Press Holdings (SPH), is an innovative software company that designs, develops, and integrates Big Data sets with mobile workflow applications to help real estate-related organizations and professionals employ real-time, relevant, proprietary information in the marketing of their products and services. It operates SRX Property and its two internet portals, SRX.com.sg and STProperty.sg. It also manages SRX Valuations, a comprehensive valuation firm. Singapore Real Estate Exchange (SRX) is information and application network formed by StreetSine Technology Group and leading real estate agencies in Singapore. Its purpose is to disseminate market-pricing information and to facilitate property transactions, making the real estate market more efficient. 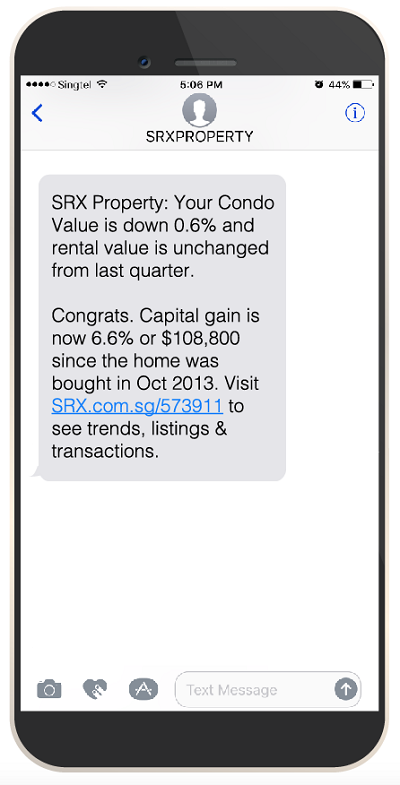 SRX Property consists of two property listing portals: SRX.com.sg and STProperty.sg. For more information, please contact Vivien Lim at vivien.lim@srx.com.sg.